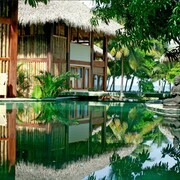 Situated near the beach, this hotel is within 1 mi (2 km) of Carmen Beach and Santa Teresa Beach. Cocal Beach and Hermosa Beach are also within 3 mi (5 km). 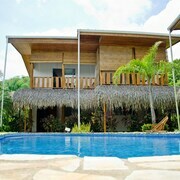 Situated in Cobano, this cabin is within a 10-minute walk of Carmen Beach and Santa Teresa Beach. Cocal Beach and Hermosa Beach are also within 3 mi (5 km). 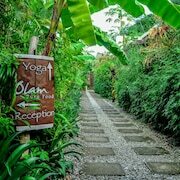 Great location, friendly and helpful staff at the restaurant and bar and onsite yoga and Pilates. A very relaxing stay. Where to find Santa Teresa hotels near an airport? Where can I find hotels in Santa Teresa that are near tourist attractions? If you are choosing where to spend the night while visiting Santa Teresa, there is a generous assortment of possibilities. Expedia has at least 36 hotels within 0.1 kilometres (0.06 miles) of downtown Santa Teresa. 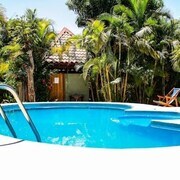 Booking a place near the heart of Santa Teresa is only a few mouse clicks away. Expedia's up-to-the-minute database features the Latitude 10 Exclusive Beach Resort and Esencia Hotel & Villas, which you'll find within a 1-kilometre (0.6-mile) radius of the city center. The Santa Teresa area has a selection of affordable hotel options that will satisfy even the thriftiest travelers. 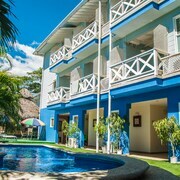 3 kilometres (2 miles) away from Santa Teresa's downtown area you'll find the Hotel Tropico Latino. The Nautilus Boutique Hotel is only 1 kilometre (1 mile) away. 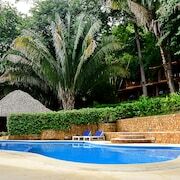 The Hotel The Place and the Esencia Hotel & Villas are alternative economical options worth checking out. The Florblanca can be found 2 kilometres (1 mile) away from downtown Santa Teresa. Another alternative is the Hotel Casa Chameleon Mal Pais, which is positioned 5 kilometres (3 miles) away. Another possibility is to check out the rates and amenities at the Hotel Punta Islita, Autograph Collection or the Pranamar Villas & Yoga Retreat. To see more of the beaches and forests in this part of Costa Rica, you may like to plan to spend time in other parts of Central Pacific Coast. You could visit local attractions or go hiking and sunbathing and then find a comfortable hotel. 4 kilometres (3 miles) from Santa Teresa is Bejuco, which is home to the Cabo Blanco Nature Reserve. Travelers staying in Mal Pais can choose from the following Expedia-listed recommendations; the Casa Zen and Santascabinas. Alternatively, you can stay at Bejuco, 30 kilometres (18 miles) to the northwest of Santa Teresa. In Bejuco, take the time to enjoy the Jungle Butterfly Farm. Room options in Bejuco include the Hotel Laguna Mar and Cabinas Corozalito. Consider spending an afternoon rubbing shoulders with local sports fans at a local game. You'll find Tronadora Arena 100 kilometres (61 miles) to the north of Santa Teresa. Book accommodation near the action at the Hotel Puerto San Luis or the Lake Arenal Hotel & Brewery. Juan Santamaria International Airport is a logical airport for flying into and leaving Santa Teresa. It is 110 kilometres (70 miles) away. If you plan to stay nearby, try the Costa Rica Marriott Hotel San Jose or Hampton Inn and Suites San Jose Airport. What are the most popular Santa Teresa hotels? Are there hotels in other cities near Santa Teresa? 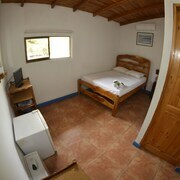 What other types of accommodations are available in Santa Teresa? Explore Santa Teresa with Expedia.ca’s Travel Guides to find the best flights, cars, holiday packages and more!